Granite, Marble and Quartz Countertops. We provide granite, marble and quartz countertops to customers throughout Palm Beach County. Unlike many other countertop providers, we only do countertops, nothing else. Also unlike other companies, we do our own fabrication and installation, controlling the process from stone selection to installation. We also stock many hard-to-find granite and marble slabs so that customers can stop wasting time driving from store to store. Most of our work comes from kitchen countertops. It's our specialty. From small to huge, we've done it all. I'm sure we can help with yours. Remnants available. If it needs a countertop, we do it. Includes BBQ's, bar tops, stairs, window sills and more. Finding the ideal stone is crucial. We get it. That’s why we keep a perfect blend of diverse materials and colors in stock so you can find the one that’s just right. We’re not only a fabricator and installer of granite, marble and quartz countertops, but also a direct importer of natural stone. We offer a wide selection of highly researched, hand-picked stones from some of the most renowned quarries in the world. We study the latest trends, ongoing customer demand and seasonal variations to determine which stones to import. Instead of offering hundreds of unappealing slabs, we predict which ones you’ll like and import those. Because we do our own fabrication, we have many left-over pieces from other jobs, many of which are highly exotic. Pick a remnant piece from our fabrication center for smaller jobs like bathroom vanities, window sills and barbecues, and save money on your material by not buying an entire slab. Over the years, we’ve measured, cut, polished and installed a huge variety of both residential and commercial projects. From a typical kitchen countertop to 30 ft. fireplaces - we've done it all. Armed with skilled workers, years of experience and the best technology available, we strive for a perfect finish every time. Our team, based in Boynton Beach, Florida, uses techniques that blend the careful touch of expert craftsmanship with new technologies. We utilize some of the most advanced fabrication processes available. 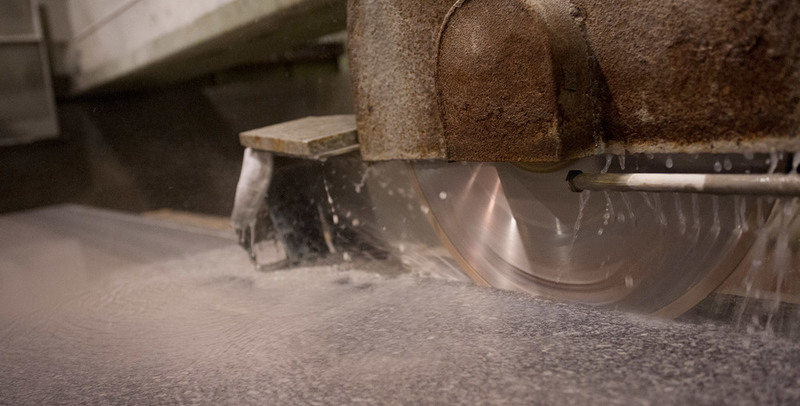 All slabs are cut with up to 1/32" accuracy and finished with diamond infused pads for an impeccable shine. As a result of all our efforts, our fabrication center meets the stringent high quality requirements set by the following quartz and solid surface countertop makers: Cambria, Vetrazzo, Silestone, Caesarstone and Pompeii. All have approved us as their certified fabricator, a task many years in the making. Come to our showroom and get help from real people who know everything there is to know about granite, marble and quartz countertops — people you can call directly or speak to in person at our store whenever you have questions or concerns. With other companies, obtaining reliable information can be frustrating. Getting honest help shouldn’t be that hard. And with us, it never is. Chances are you haven't gone through the process of buying countertops more than we have. That's why we're here to help guide you through the steps. Should you have any questions, concerns or comments we will surely take care of them for you, Even after we complete your job, we don't just leave you hanging. We are here for you whenever you need us. It's part of our reputation. Thank you! Your message has been sent to one of our team members. You will be contacted as soon as possible.